High Fibre recipes to control diabetes, Fibre Rich Indian diabetes recipes. 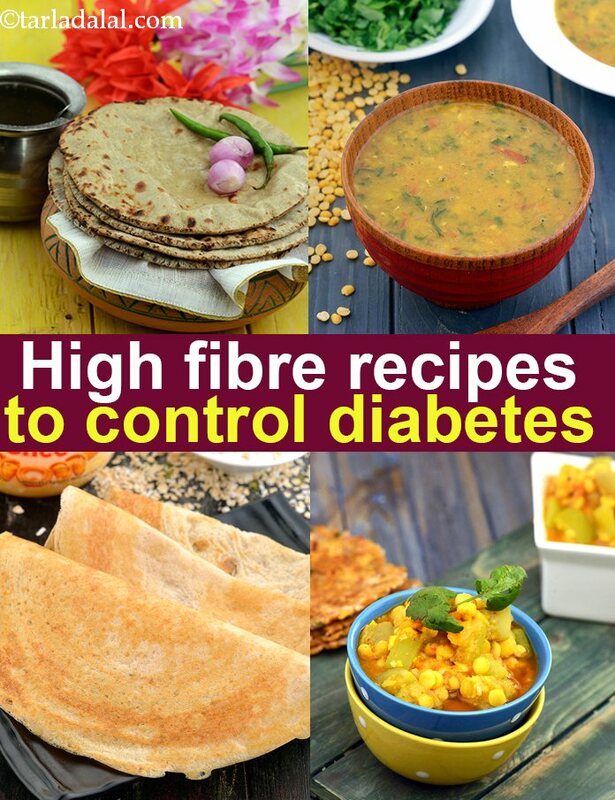 High Fibre recipes to control diabetes, Fibre Rich Indian diabetes recipes. Fiber, a key nutrient for diabetics, delays the digestion of food and prevents the sudden rise in blood sugar levels immediately after a meal. A good dose of fiber thus forms a very important part of a diabetic menu. Begin your day with a fiber breakfast like Oats Methi Muthia or Aliv Nutri Paratha and accompany it with a fruit for a complete fiber rich experience. Jowar and Vegetable Porridge and Broken wheat Upma are a few healthy fiber rich breakfast options in a bowl. For main meals you can try recipes like Bulgur Wheat and Matki Pulao, Cabbage Carrot and Lettuce Salad and Doodhi and Chana Dal Subzi. Pair your gavarfali sukhi subzi with fiber rich bajra roti, jowar roti, jowar bajra garlic roti or whole wheat roti to make a healthy combination. And of course, we haven’t forgotten snacks. Bulgur Wheat Pancakes, Chana Dal and Cabbage Tikki etc. are a few options to treat your taste buds while keeping a check on blood sugar levels. On days that you want to be in for a high fiber one dish meal, you can opt for recipes like Methi and Moong Sprouts Wrap, Broccoli Mushroom and Bean Sprouts Stir-fry or indulge into a simple Stuffed Nachni Roti. Ensure that you don't use too much oil in your cooking. These recipes will keep your sugar levels in check and we are sure you will the motivated to try a few more recipes using these healthy ingredients to get more variety and spice to your dishes. Enjoy our High Fibre recipes to control diabetes, Fibre Rich Indian diabetes recipes and other fiber articles below.